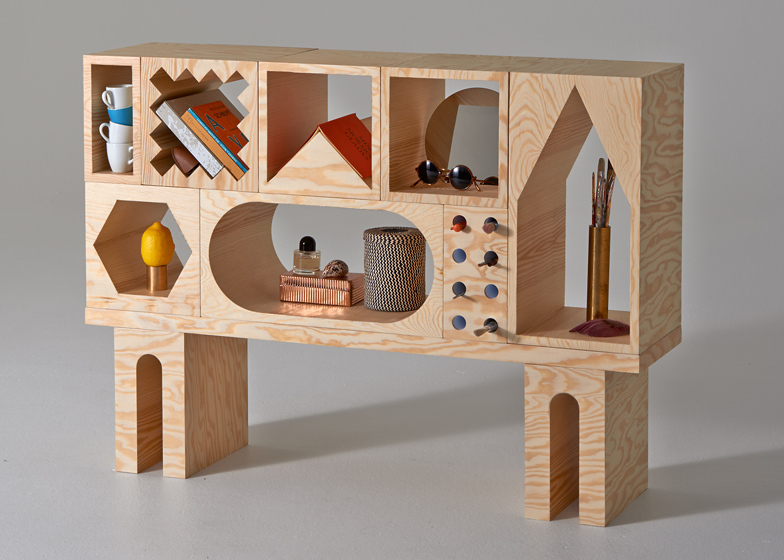 Stockholm designers Erik Olovsson and Kyuhyung Cho added different shaped holes to the stackable wooden blocks that make up this flexible shelving unit, creating spaces suited to displaying various items. With the Room system, Olovsson and Cho wanted to challenge the assumption that objects should always be displayed within a rectangular space. They created a modular system of 25 stackable blocks, a low table and a stainless mirror piece. Each part features a geometric void, the shape of which is defined by the objects it might hold, from books to vases, bottles and plants. "We put things into square spaces without thinking about the relationship between the object and the room it's in," Olovsson told Dezeen. "The Room collection has various different voids, in a bold and unconventional way, to give each object a greater focus by giving it its own room." "Each block was inspired by a specific object, creating various shapes and sizes," he continued. "The round for wine, zigzag for phones, tablets and laptops, or peaked for an open book. Each block can be a room to invite any object - the composition is unlimited." The elements can be combined to form a long shelf or a tall cabinet with a variety of different sculptural compositions. "Our intention is also to let people to explore their own composition with just a few pieces or the whole set as a shelf, which maximises flexibility of the relationship between object and space," said Olovsson. The collection is made from matte-lacquered plywood. "Although the mix-and-match system is flexible, the form and structure is strict," Olovsson explained. "We wanted to add warmth and softness with the natural pattern of wood. A matte-lacquer finish is less affected by reflection and allows the wood grain and the form to present in a gentle way." The design is currently at prototype stage, and Olovsson and Cho are looking for a manufacturer. The duo has also collaborated on designs for a wave-shaped coat rail that keeps items evenly spaced. Photography is by Gustav Almestål.